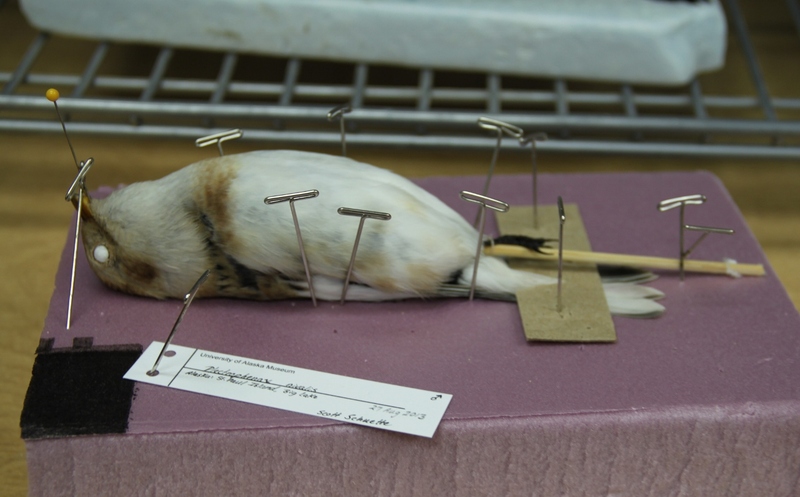 This snow bunting skin was prepared at the Heinrich Springer Ornithology Laboratory of the Museum of the North, University of Alaska Fairbanks. The skins are mounted on a stick, so that they can be handled without touching the skin. This specimen was collected at St. Neill Island, Big Lake, Alaska, August 27, 2013. Cite as: Campbell, Sandy. "Snow bunting skin at the Museum of the North, Fairbanks, Alaska". Photograph. 2016. University of Alberta. ERA: Education and Research Archive.